Is damaged granite cobble curbing ruining your reputation for quality work? 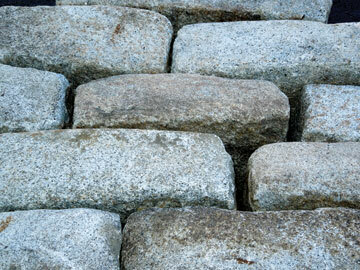 Our jumbo reclaimed Congress cobbles are 7-8" deep and offer a much more durable installation for about the same material cost. A 4" reveal can provide up to 4" of the cobble buried below grade. This provides for a more damage resistant installation and more satisfied customers. This material is also great for driveway aprons.